The fish finder rig is a classic catfish rig. 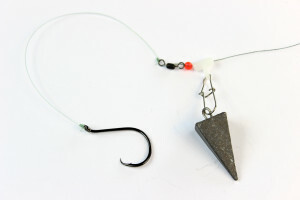 A simple fish finder rig with inline flat lead is another very popular catfish rig. An advanced fish finder rig with a Korda camouflaged inline lead, anti-tangle sleeve, swivel protector, hook and hair rig. These camouflaged catfish rigs are super effective against pressured fish. 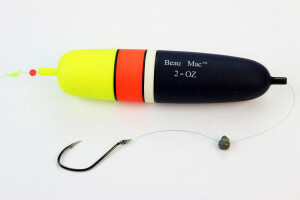 The fish finder rig involves a lead that slides up and down the mainline with the hook on the end of the mainline. 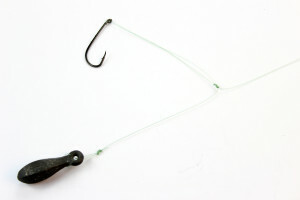 The lead slides on the mainline by using a sliding swivel or an inline lead. These catfish rigs place your bait directly on the bottom. The fish finders are extreme sensitivity catfish rigs. It’s a very sensitive rig because the hook is attached onto the mainline. The rig is also a good choice when fish are being skittish. By adjusting the tension in your mainline you can adjust how much and when the fish feels any tension. The down side to a fish finder rig is that they tend to tangle when casting and don’t cast as far as some other rigs. Fish finder rigs are a poor choice is the catfish are not feeding on the bottom or if there is a lot of mud or weed on the bottom which can hide your bait. High low rig from Eagle Claw may be marketed to crappie fisherman but they are fabulous catfish rigs. The high-low rig, like its name suggests, is a helicopter rig with one hook high and the other hook low. 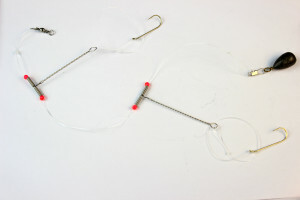 These rigs can be bought pre-made and often have wire arms that help keep the hooks from tangling with the mainline. 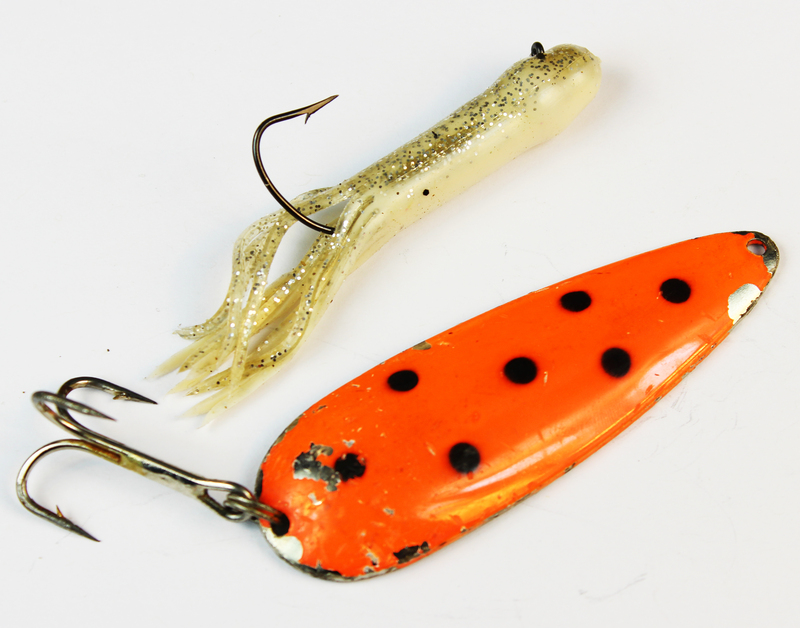 High-low rigs put one bait on the bottom and one just an inch or two above the bottom. When fished with a tight mainline and an upright rod, the high-low rig helps elevate at least one of your hooks off the bottom. This can keep your bait out of reach of cray fish and out of the mud or weed. The two hooks also means that you can put more bait in the water and increase the scent which draws catfish in. The downside to these catfish rigs is that you have to buy them, they are not very camouflaged and can alert pressured catfish. High low rigs also tangle quite easily and the second hook can snag on things when fighting a fish. 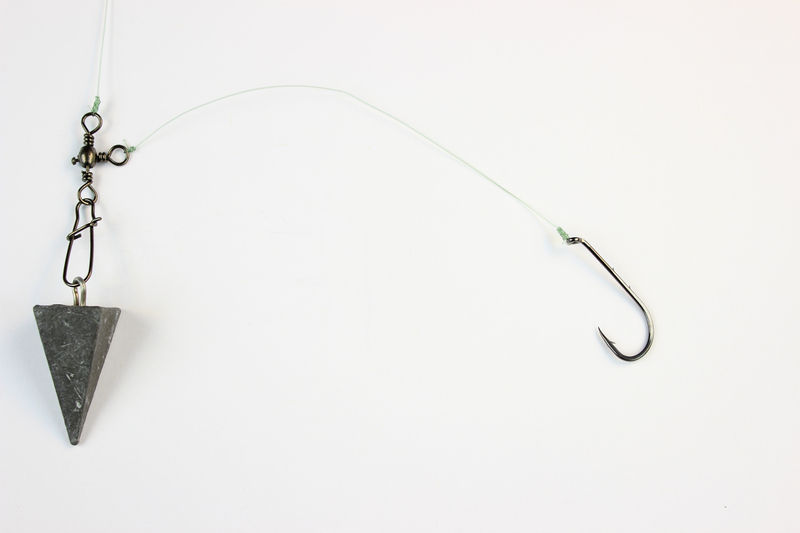 The presence of two hooks and bait also decreases aerodynamics and hurts casting distance. 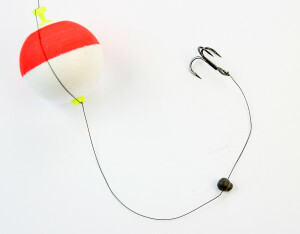 Simple helicopter rigs like this one are the simplest catfish rigs to tie. Helicopter style catfish rigs have a weight to the end of your mainline and have a hook attached to a small leader coming off the mainline. Helicopter rigs place your bait on the bottom. Helicopter rigs cast extremely far and very simple to make. Helicopter rigs tend not to tangle as much as other catfish rigs either. The down side to these catfish rigs is that you have less sensitivity compared to a fish finder rig and it does not raise the bait off the bottom like a High-Low rig. Bobbers with split shot lead and a treble hook are great catfish rigs for slow moving rivers and shallow lakes. Floats and bobbers puts your catfish rigs somewhere between the surface and the bottom by suspending your bait underneath a floating object. Floats are fabulous for fishing above snags. Bobbers and floats are essential catfish rigs when the fish are not feeding on the bottom. Bobbers and floats are also great catfish rigs for drifting your bait down a river or across a lake. Floats and bobbers are not good catfish rigs if the catfish are feeding deep or if you need to cast far distances. Floats and bobbers can also be a problem if its windy or choppy because it makes your bait bounce up and down and get dragged around. Live lining is when you tie a hook on the end of your mainline and use a live fish as bait. You cast the fish out there and let it swim around. These are exciting and powerful catfish rigs, especially when targeting flathead catfish. The lack of swivels and leads attached to the line makes this a perfect catfish rig when fishing for smart, pressured catfish. Catfish brutally assault live bait, resulting in spectacular takes and big fish. The downside to live lining is that it’s hard to control exactly where the fish goes and casting distances are limited. Finding and keeping your bait alive while you fish is also a challenge. Two great catfish lures. A jig and a spoon. Lures and jigs are unconventional catfish rigs but you can catch catfish on a lure just like a bass or trout. 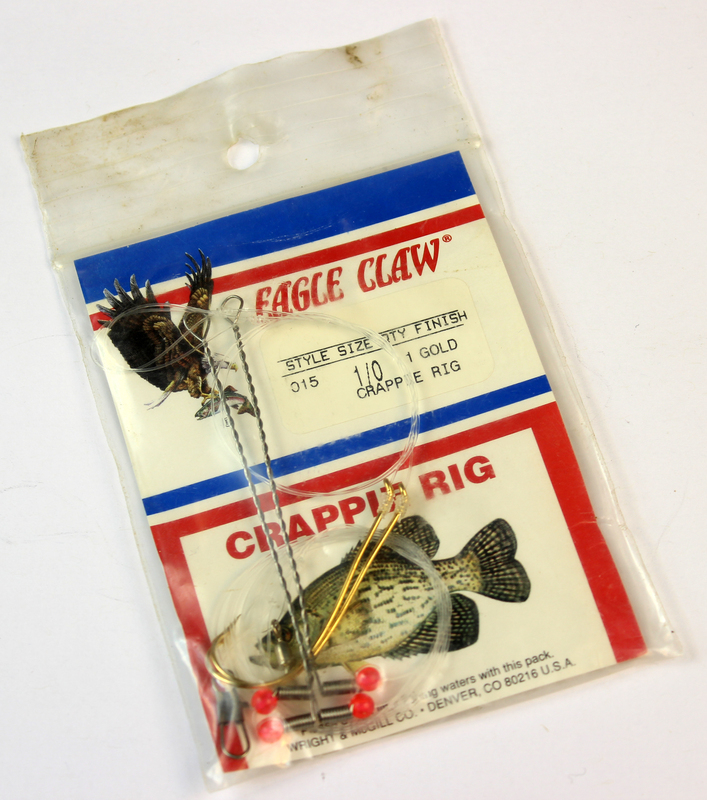 The best catfish lures can be fished slowly along the bottom and are snag resistant. Lure fishing for catfish is a fun novel way to catch catfish. It is also a great way to find where the catfish are at if you have to search through a lot of water. Lure fishing for catfish is difficult in snaggy areas, unfortunately catfish love snaggy areas. Additionally, lure fishing requires more effort, you must constantly cast and retrieve rather than sit and wait and you can only use one rod at a time when using these catfish rigs. Trolling is when you drag lures or bait through the water behind a boat. Trolling catfish rigs involves either a large amount of weight or a diving plane. weights and diving planes are designed to keep the catfish rigs at a certain depth while its being dragged behind the boat. Trolling allows a fisherman to cover a lot of water very quick which increases your chance of finding out a where the big ones are hiding. The down side of trolling is that it requires a boat and that the fish must be actively hunting. If the fish are hunkered down in their holes on the bottom you may just pass them by. For more information on trolling for catfish check out this article in InFisherman Magazine.